Yuri Sidorenko (born 1958, Sarov, Russia). 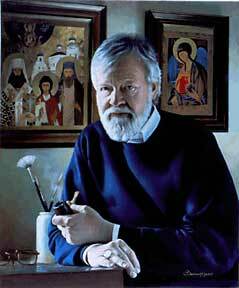 He is a Russian born iconographer and painter. His work is found in Orthodox churches and on art galleries on the California coast. He received an education in art from the Moscow Art School (1968-73); and in 1981, was awarded a Master of Arts Degree in Architecture and Interior Design by the Moscow Architectural College. Although he feels he has been most influenced by Rubens and Van Dyck, he feels that it is Sermiradsky, a Russian artist, who is a master of composition; he also highly admires the American painter Sargent for his free, colorful style. With regards to his own work, he says "In explaining my choice of style, I can say that eternal beauty can be expressed differently, but (that) my goal today is to continue the great tradition of European Romantic Realism". Yuri Sidorenko is married to Vera, a Russian folk artist. This page was last modified on 12 May 2017, at 17:49.